Wayna Picchu or Huayna Picchu, means "young mountain" in the Quechua language. 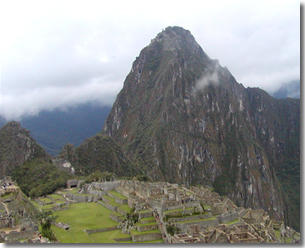 This pyramidal mountain, across from Machu Picchu and slightly above the citadel, hosts many archaeological site groups. The path to Huayna Picchu starts in the North end of the Citadel and follows a stair that has many of its steps carved in the rock proper. The ascension takes approximately one hour climbing at a moderate pace. There is a place of worship on the top formed by huge crags meticulously engraved, and there is also an impressive view of the entire complex from its summit, a vista that hikers can appreciate at dawn as a unique and unrepeatable picture in their lifetimes. Take a Machu Picchu tour and discover on the Huayna Picchu architecturally caves, most likely used to hold mummies of important Inca ancestors and provide places for their worship. Another very interesting option to visit, for lovers of history are the Mayan ruins in Mexico, know these impressive constructions and the way in which lived ancient inhabitants of the area.